Qik Joe Safe Pet Ice Melt does not contain salt of any kind. It is environmentally safe, non corrosive, and contains no chlorides. Unlike so many other ice melting agents, Qik Joe Safe Pet will not burn or cause irritation to your pet. When used as directed, Qik Joe Safe Pet should not harm good quality air-entrained concrete, grass, shrubs or carpet. Milazzo Industries, Inc., your complete source for a full line of snow and ice control products, now offers a product that is safe for pets. Qik Joe Safe Pet Ice Melt does not contain salt of any kind. It is environmentally safe, non corrosive, and contains no chlorides. Unlike so many other ice melting agents, Qik Joe Safe Pet will not burn or cause irritation to your pet. When used as directed, Qik Joe Safe Pet should not harm good quality air-entrained concrete, grass, shrubs or carpet. Qik Joe Safe Pet won’t leave an oily, dirty residue. This product will prevent ice and snow from re-bonding, even at lower temperatures. Choose the ice melt that is backed by a company that prides itself on its high quality products, with a focus on customer satisfaction, service, and most importantly, safety. 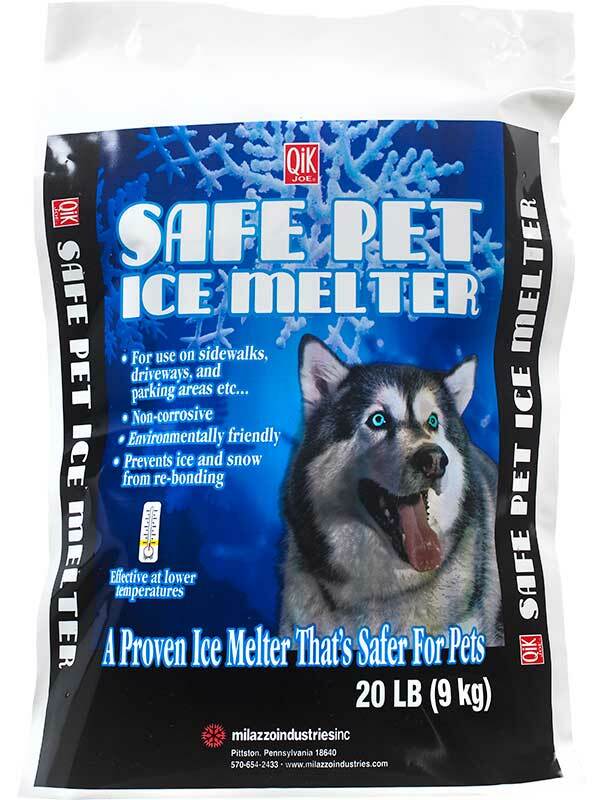 Choose Qik Joe Safe Pet Ice Melt, a product that not only melts ice, but provides peace of mind.